Everest Mountain flight is the exciting journey for the sightseeing of Mount Everest and other towering Himalayas in Nepal. The snow-capped mountain range lies to the north borderline of Nepal is famous as the Himalayas. This is gigantic, gorgeous and higher than other mountains in the world. Mt. Everest the world’s highest mountain on earth with a height of 8848m/28756ft locates in this Himalayan range. This is the fact that visit to Nepal will not complete without seeing the Himalayas especially Mount Everest. The popular path to experience Nepal Himalayas is trekking and climbing. Every year millions of travelers from around the world visit Nepal for the trekking or climbing to the Himalaya. 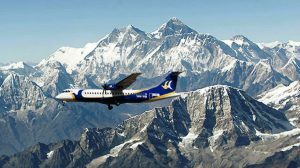 Everest Mountain flight is locally known as mountain flight offers a great opportunity to all travelers who are not trekkers and mountaineers to come face to face with the majestic peaks of the Himalayas including Mt. Everest. This is a 1-hour flight that set off from Kathmandu airport and lands in the same airport. Nepal’s most of the private airlines have been offering this flight every day in the morning. During the flight you can see breathtaking panorama of a series of magnificent mountains –Everest (8848 metres), Langtang Lirung (7234m), Gauri Shanker (7134 m), Ganesh (7429m), Shisha Pangma (8013m ), Gyachangkang (7952 m), Pumori (7161m), Nuptse (7855m), Lhotse (8516 m), Ama Dablam (6812m), Chamlang (7319m), Makalu (8463 m), Cho Oyu (8201m) and Kanchenjunga (8586 m) at far eastern end with many more amazing peaks. It is just such a vast vista that you will be scarcely able to believe your eyes but you will have some unforgettable memories and photographs. This flight can include any trips to Nepal. For this flight, you will be picked up from your hotel at 5.30 am and transfer to Kathmandu airport. Then board for this flight. The 1st flight takes off at 6:30. After 1 hour flight, the aircraft land in Kathmandu airport. Then you will be transferred to your hotel. Please contact us for the price and the booking of Everest Mountain Flight.